From ancient Mayan folklore that long-snouted serpents came from Mars to the more contemporary alien DNA myths of The X-Files, people have long been fascinated by the possibility of life beyond Earth. That includes University of Missouri–St. Louis’ David Horne. An assistant teaching professor in the Department of Physics and Astronomy, Horne specializes in astrobiology. 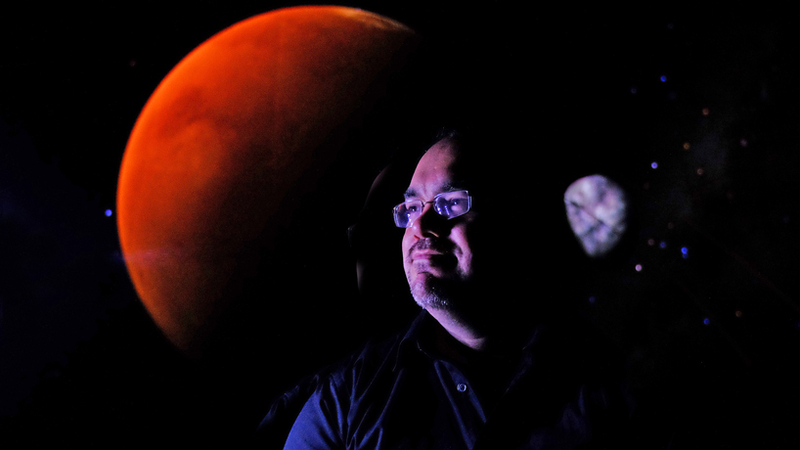 He researches the atmospheric conditions of Mars that may reveal evidence of life on the red planet. This Friday Horne will share his insights on that search, as well as the possibility of a human expedition to the planet, as part of the Astrobiology and Life Beyond Earth conference April 8 and 9 in the J.C. Penney Building and Conference Center at UMSL. 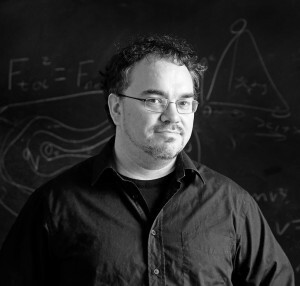 His colleague Erika Gibb, professor of physics and chair of the department, will also present at the conference. With all this talk of “alien” life, UMSL Daily caught up with Horne before his presentation this week. David Horne specializes in the atmospheric conditions of Mars, analyzing if the planet might have supported life at one time. Many people imagine little green men when they think of Martian life, but what kind of life forms are we really seeing evidence of, if any at all? So far we have not found any definitive evidence that life ever existed on Mars. If ever there was life on Mars, it likely existed in warm, briny water earlier in the planet’s development. If life exists on Mars today, it is likely in the form of bacteria locked in the permafrost, or at best it might have been some form of algae living in pools on the surface long ago. Current research is trying to determine how much water may have been present on the surface of Mars in its past. It is unlikely that complex life forms similar to those that we see on Earth ever developed on Mars. We certainly see no evidence that any intelligent society ever occupied Mars, and we see no evidence for any ancient civilization whatsoever. What evidence of life are we searching for in particular? Indicators of life will be the detection of complex hydrocarbons and chemicals such as amino acids capable of forming life. Water is always an important factor when searching for carbon-based life forms. The acid or base nature of that water and the presence of dissolved salts in general would also be crucial to our search for life on the red planet. There are no signs of water on the Martian surface today (30mbar atmospheric pressure will not allow it), but there have been recent indicators that water may be flowing just below the surface. Possible gasses evolved from respiring bacteria on the surface would be another reasonable indicator of life. However, an experiment of this type carried on the Viking lander in the late 1970s proved inconclusive. Despite such findings as the ALH84001 potential microfossil, there is as of yet no conclusive evidence of past life on Mars. How many years away are we from a human expedition to Mars? This question is really a matter of when do we make the decision to go to Mars and overcome the technological and societal challenges to do so. I believe it is unlikely that we will see a human expedition to Mars within 50 years. (Unless there is a serious change in thinking!) If humans found a sufficient reason such as an essential resource located on Mars or a space race develops similar to that of the 1960s moon race, then we would likely reach Mars much more quickly. During the development of the Apollo moon missions, designs were drafted to continue exploration as far as Mars, but these designs were all scrapped. In terms of propulsion technology it is likely that humans could build a vehicle to reach Mars today. There are, however, many other considerations – long duration spaceflight’s effect on humans; radiation exposure during the journey; food, water and air replenishment ­­– that still need to be addressed. Another factor that should be considered is that as remote rovers/robots and telepresence technology improves, the need to send humans diminishes. Ironically improvements in technology may actually delay a human mission even further. Would you ever go yourself?